"Turning cows into milk machines has led to epidemics of “production-related diseases”, such as lameness and mastitis (udder infections), the two leading causes of dairy cow mortality in the U.S. This weakness is due to the extreme genetic manipulation and supplemented hormones which cause unnaturally high milk yields. According to the USDA, 1 in 6 dairy cows in the U.S. suffers from clinical mastitis. This level of disease is reflected in the concentration of somatic cells in the milk. When a cow is infected, more than 90% of the somatic cells in her milk are neutrophils, the inflammatory cells that form pus. The average somatic cell count in U.S. milk per spoonful is 1,120,000, however, the dairy industry says this pus doesn’t matter because the milk is pasteurized (the pus gets ‘cooked’). Elmhurst Dairy, which has been in the dairy business since the 1920's has switched from dairy to plant based production. Unlike pasteurized dairy, these products are actually good for you. Television commercials and advice from your doctor lead you to believe the secret to strong, healthy bones is drinking milk and taking drugs. But that's a huge misconception and a big lie, believes Vivian Goldschmidt, MA, founder of Save Our Bones - the world's largest natural osteoporosis community. Sure your bones need calcium, but if you consume large quantities of milk, you're actually draining your bones of this much needed mineral. Milk has an acidifying effect on your body. Let me explain. Everything we put into our body gets processed and alters its acid/alkaline balance. And like everything in nature, the body tries to correct the imbalance. So because milk has an acidifying effect, your body automatically pulls calcium out of your bones to neutralize the acid attack. Because it is a potent neutralizer. That's why the main ingredient in some antacids is calcium. Think of milk entering the body like a raging forest fire and your body's natural processes is the team of brave firefighters. So your body jumps into action and uses calcium to put out the acidic attack. And even though milk contains 300 mg of calcium in one cup, unfortunately, the net result is a calcium deficit in your bones. So what should you drink instead? Vivian recommends drinking almond or rice milk as a delicious alternative to milk. And unsweetened fermented or cultured dairy products such as yogurt, kefir, and sour cream are okay to enjoy. This is just some of shocking information in Vivian Goldschmidt's Save Our Bones Program. In her program, Vivian proves that your bone health is in your hands, and if you give them what you need and stop consuming bone thieving foods and drinks you can have the bones you had when you were younger - without the help of your doctor and of drugs. Since 2007, her program has helped over 200,000 people who sufferer with osteoporosis and osteopenia to naturally increase their bone density without pills, pain, or cost. And now, she'd like to show you how you can do the same. Click here to discover how you can cure osteoporosis naturally. Her revolutionary Save Our Bones Program is jam-packed with pure, unfiltered natural osteoporosis content that you can start applying right after you read it... Information you won't find anywhere else. And it's guaranteed to reverse your bone loss and give you your freedom back. I reviewed the program and it's the real deal - it's all based on studies which she uncovered, compiled and synthesized and gives you the bottom line, simple actions you need to take to finally conquer osteoporosis and take your bone health into your own hands. And what you'll learn along the way will change your life. Click here to learn more about Vivian's Save Our Bones Program and see for yourself. Corrupt state governments, like Michigan, tell their citizens they cannot buy these farm fresh products??? Of course, they are really good at determining the best policies for their citizens. Never mind having the poorest city in the nation (Detroit) under their thumb...just do as we say... We know best (is their attitude). They are nothing but a gang of criminals...no doubt, acting at the behest of some giant agribusiness, against small farmers and the people of their state. Why does government want to prevent people from consuming raw milk? For the answer, click HERE. Hooray! Butter Is Back! Butter IS a Health Food! For millennia, butter has been prized for its abundant health benefits, not to mention culinary appeal. Keep in mind that butter's nutritional value depends on how the animals are raised, however, as the fatty acid composition of butterfat varies according to the animal's diet.The very best quality butter is raw (unpasteurized) from grass-pastured cows, preferably certified organic. (One option is to make your own butter from raw milk.) The next best is pasteurized butter from grass-fed or pastured organic cows, followed by regular pasteurized butter common in supermarkets. Even the latter two are healthier choices by orders of magnitude than margarines or spreads. Beware of "Monsanto Butter," meaning butter that comes from cows fed almost entirely genetically engineered grains. This includes Land O'Lakes and Alta Dena.Research points to the fact that butter may have both short-term and long-term benefits for your health. One Swedish study found that fat levels in your blood are lower after eating a meal rich in butter than after eating one rich in olive oil, canola oil, or flaxseed oil.The scientists' main explanation is that about 20 percent of butterfat consists of short- and medium-chain fatty acids, which are used right away for quick energy and therefore don't contribute to fat levels in your blood. 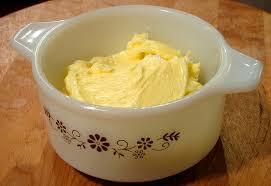 Therefore, a significant portion of the butter you consume is used immediately for energy—similar to a carbohydrate. The other oils (olive oil, canola, flax, etc.) contain only long-chain fatty acids. The primary nutrients found in butter are outlined in the table below. For more information on the health benefits of butter, refer to this classic article by the Weston A. Price Foundation. Nutrients in Butter: Vitamin A in the most absorbable form, Lauric acid, Lecithin (necessary for cholesterol metabolism and nerve health), Antioxidants Vitamin E, Vitamin K2, Wulzen factor: hormone-like substance known to prevent arthritis and joint stiffness (destroyed by pasteurization), Fatty acids, especially short and medium-chain, in the perfect omega-3 to omega-6 balance, CLA (Conjugated Linoleic Acid): anti-cancer agent, muscle builder, and immunity booster, Vitamin D, Minerals, including selenium, manganese, chromium, zinc, and copper, Iodine in a highly absorbable form, Cholesterol Arachidonic Acid (AA): for brain function and healthy cell membranes, Glycospingolipids: fatty acids that protect against GI infections. The highest amounts of CLA and omega-3 fats come from cows raised on grass pastures. Their butter is also 50 percent higher in vitamins A and E, and 400 percent higher in beta-carotene, giving grass-fed butter its deeper yellow color.